Love this show and this album! I saw this original cast back in December and they were FIERCE! I enjoyed it so much that I went back a second time and caught the show with 2 of the understudies and they were also FIERCE! What a bundle of talent in this cast. Buy the album, you will love its catchy tunes. My favorites vocals are "It's Good To Be Alive" by the powerful Conor Ryan(Johnny Blood) and "What Is This Feeling" with the crystal clear perfection that is the voice of Emma Degerstedt (Susanna). The song that makes me smile the most is "Just For You" by Ryan and Lauren Molina(Bella) which was a high point in the show for me. This cast has a chemistry that is unmatched and they have brilliantly created the most memorable characters. I hope this show has a well deserved long run now that it has transferred to a new theater! Hoping to see it again soon! Catchy tunes, witty lyrics - wonderful show! 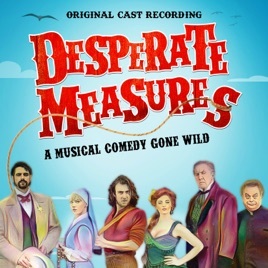 I had the pleasure of seeing "Desperate Measures" when it premiered at the York Theatre in 2017. It was an infectiously wonderful production and, days later, I found myself humming the music, one of a small handful of new shows (Broadway or Off-Broadway) that can claim such a distinction in my book. Sadly, the cast album hadn't been recorded at the time, and I have been anxiously waiting eight months for its release. Finally, here it is! This recording captures the fun and humor and joy of the show! And, now that the show has moved to a bigger theatre Off-Broadway, I'll have to go see it again!